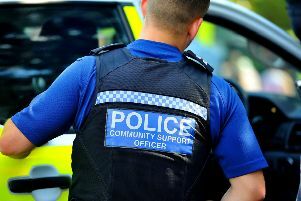 Sussex Police has pledged its support for Brighton and Hove Albion, as the football club edges closer to the Premier League. Chief Constable Giles York joined football liaison officer PC Darren Balkham to raise an Albion flag at Sussex Police’s Lewes headquarters, Mr York said: “The boys in blue are really coming together - and I’m talking about the Albion, preparing for the Premiership. “The boys and girls in blue in Sussex Police are fully supportive of your ambitions this weekend. We’re right behind you. “You are at the heart of our communities and we are at the heart of our communities. That’s one thing we’ve got in common. Albion are top of the Championship and could seal a return to the top flight of English football for the first time since 1983 this weekend. The Seagulls will be promoted if they win at Wolverhampton Wanderers today (April 14) and at home to Wigan Athletic on Monday (April 17), and third-placed Huddersfield fail to win both games.